We understand very well the rhythm of your workflow and know how valuable time is for you; this is why in Transportes Pitic we are fully committed with each one of our services quality and we have implemented the highest technology on line to bring you simplicity, agility and comfort on every shipment. 24 terminals strategically located within the Mexican territory. 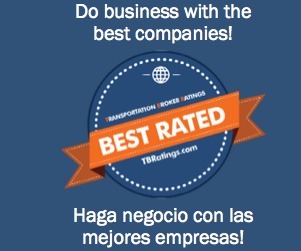 Transportes Pitic has been rated as “BEST RATED” company since 2008. Es siempre todo un placer hacer negocios con Pitic. Su personal es muy amable y sobre todo muy profesional. Tenemos casi 7 años trabajando con ellos y sus pagos siempre han salido a tiempo. - - - - - - - - - - - - - - - - - - - - - - It is always a pleasure doing business with Pitic. Their staff is very friendly and above all, very professional. We have been working with them for nearly 7 years and their payments have always come on time.